One HAZMAT responder returns with a tool as his colleague carefully inspects the meth lab. Police establish a safety perimeter around the meth lab discovery site. 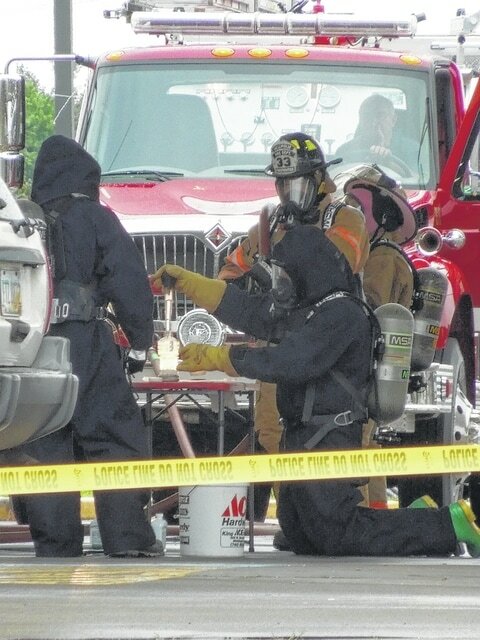 Hazmat responders test for the presence of meth in a plastic bottle recovered from a Honda Civic parked in front of Go-Mart on Eastern Avenue. GALLIPOLIS — Gallipolis police and HAZMAT responders discovered and confirmed the presence of an active meth lab Wednesday afternoon in a black Honda Civic parked at a convenience store/gast station along Eastern Avenue. Four individuals were detained and charges are being referred to the Gallia County Prosecutor’s Office. Meth technicians from the Gallipolis and Middleport police departments paired to work on the project as Gallia EMS and Gallipolis Fire Department personnel rested nearby to provide support. Gallipolis Police Department initially responded to a domestic disturbance at Go-Mart around 4:32 p.m. Individuals involved in the disturbance, police said, were also the subjects of an earlier investigation. While handling the disturbance, officers noticed an item they suspected of being an active meth lab in the back seat of a black Honda Civic. After establishing a safety zone around the vehicles, meth technicians were contacted. The store stayed open for a short time, even though the parking lot was cordoned off by police tape and vehicles, until the Middleport Police Department technician arrived on scene. The store temporarily closed due to safety concerns once more technicians arrived. The lab was neutralized without injuries or issue. Patterson noted that all suspects involved were in their 20s — two males and two females. Methamphetamine, also called meth, is an odorless, white and bitter-tasting crystalline powdered substance. It prompts the increased production of the brain neurotransmitter dopamine, which is often associated with feelings of reward, pleasure and motivation. Meth’s ability to suddenly increase the amount of dopamine in the brain causes the individual taking it to feel a sudden rush of pleasure. Repeated use results in addiction. Meth has been noted to damage brain systems over time, hampering motor function as well as learning. Stay tuned to www.mydailytribune.com for more information as the story develops.